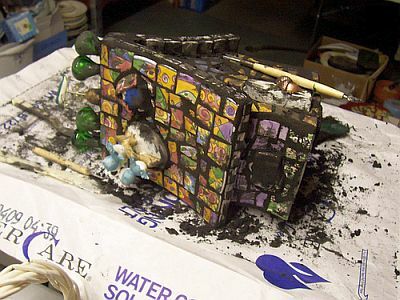 I saw some mosaics on Ebay, about 6 years ago and thought it would be something I would like to try. Being somewhat creative I thought how hard could it be? From that day I was hooked. I joined a couple mosaic groups. Everyone was so helpful and willing to answer questions. I never looked at a mosaic book till about a year ago. I prefer to work with dishes and found items. I'm still in the learning process. To tell you the truth, I don't know if I'll ever learn all there is to making mosaics. Seems things are always changing. New and better products are always coming out. 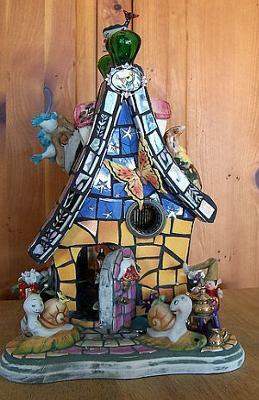 Here is my birdhouse. 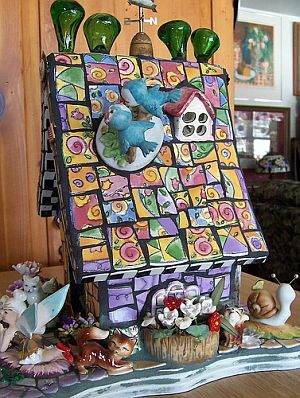 I like to take used birdhouses and make them into unique pieces of art. 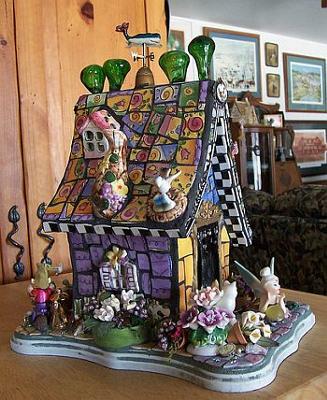 I have made a couple birdhouses that were for birds but most of my houses are for show. I'm always picking up things that I think would be interesting in a mosaic. When making a mosaic, I don't know how it will turn out until it's done. I usually don't draw out a pattern. I look through my stuff and put together things that I think would look good in the mosaic I will be working on. It's always exciting to see the finished product! I also wanted to say that mosaic artist have no age limit. It is something young and old can enjoy. It also is a form of art that doesn't require a fortune to do. I think when people are introduced to it you can see the excitement in their eyes! The only downfall is....it's addictive!